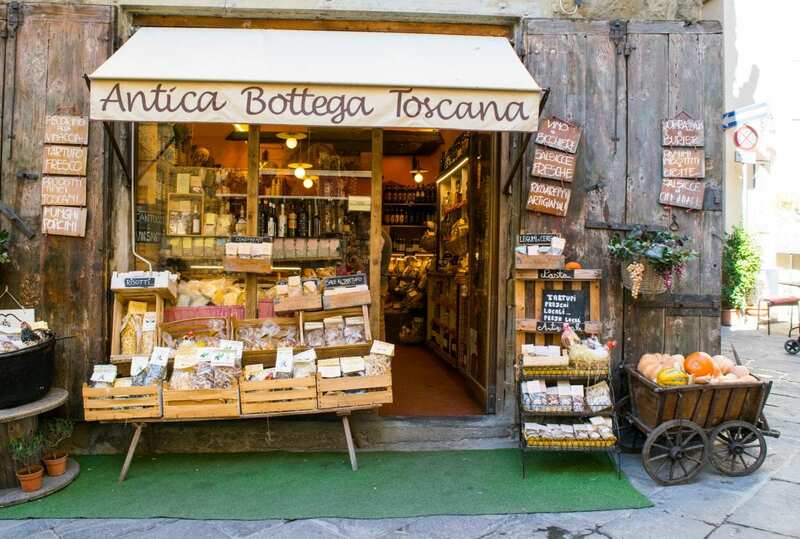 And really, when it comes to our favorite days in Tuscany, there often isn’t much to tell: or rather, what happens is far too simple to seem to warrant a story, and yet is blissfully delightful all the same. Some of our favorite days in Tuscany can be divided simply into drinks: a morning cappuccino becomes an afternoon espresso, which bleeds into an early evening glass of prosecco (or perhaps a spritz, if we’re mixing things up), which then morphs into a glass (or two, who’s counting?) of wine at dinner, that might perhaps become a shot of grappa or a decaf espresso to close the day. As for all the moments in between–well, what is there to say? We’ll get lost down a medieval street or six. There’s probably a marble church or two in town that we’ll admire along the way. Every cheese shop will call our names. We’ll duck into several. At some point, a scoop of gelato will mysteriously appear in each of our hands. Neither of us will claim responsibility for its arrival. 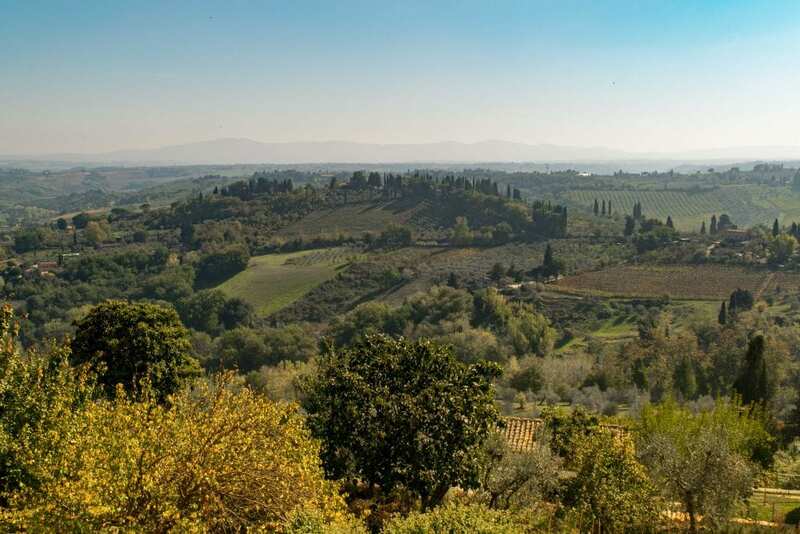 If it’s a beautiful day, we’ll hunt up a viewpoint: climb a tower or summit a hill or stand on the edge of a hilltop town, looking out over vineyards and rolling hills. At some point, we’ll stop to admire the soft, warm glow that the air always seems to have in Tuscany. The smell of leather will come wafting out of shops and market stalls, and though we know the salesmen pump that fragrance into the air with all the ferocity of an Abercrombie & Fitch employee in 2006, we’ll slow down and take a look anyway. We won’t set off for the day with any particular intention of learning things, and yet, we’ll find ourselves studying placards and looking up the stories behind various buildings and volleying historical facts back and forth to each other throughout the day. A visit to an art museum will be debated, and more often than not, dismissed. 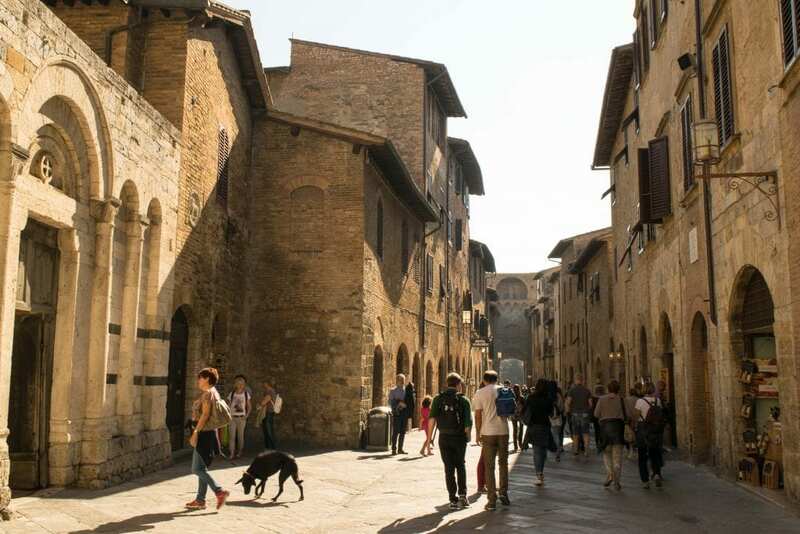 We’ll elbow each other excitedly at the sight of every cute dog–which is basically every 30 seconds in Tuscany. If we’re feeling brave, we might attempt to speak some less-than-perfect Italian to ask the owner if we can pet a particularly cute fluffball (we’ve never had anyone turn us down). At some point, we’ll sit down for a snack or a drink or just a quiet moment in the shade, and we’ll enjoy chatting and people watching so much that we’ll be slightly surprised when an hour has passed, as if the same thing hasn’t happened a dozen times before. We’ll spend all afternoon hunting for the perfect trattoria or osteria for dinner. Serious debate will be given to whether it’s a pasta or a meat dish kind of night (the pasta will usually win). And when all is said and done we’ll wander, probably slightly tipsy (“Should we just get the bottle?” “Why not!”) back to our hotel in Florence or Siena or Lucca or Arezzo, and perhaps we’ll even take note of how we didn’t really do much that day: not “enough” work, not “enough” research. And at that moment, the lights on the buildings will be twinkling, the murmur of Italian will be echoing across squares from each tiny restaurant, the buskers will be adding a soundtrack to the town, and we’ll squeeze each other’s hands and marvel, once again, that we are spending a quiet evening together in one of our favorite places on the planet. Though we are absurdly grateful for our lifestyle that allows us to do so many incredible things in any given day, month, or year, it’s the luxury of time that often feels like the truest gift–the luxury of being unhurried, with no vacation days to count or round-trip tickets to keep track of. Tuscany feels like a place where you would do little Kate. Or nothing at all 🙂 Just sit back, relax and enjoy some eye-popping views. Fabulous chill spot. Super post, as always! Tuscany is my dream destination. And, I totally agree that there are places where you don’t really need to do much, but savour it bit by bit. I recently went to s place like that in Kerala – Fort Kochi. It’s a place where one can spend a lazy day and yet feel accomplished. It’s definitely a place worthy of the dream status! Hope you get to savor it slowly one day. This is so beautifully written. And it makes me want to get to Tuscany right now! I can’t wait to explore this region of Italy! Aw, thank you so much! 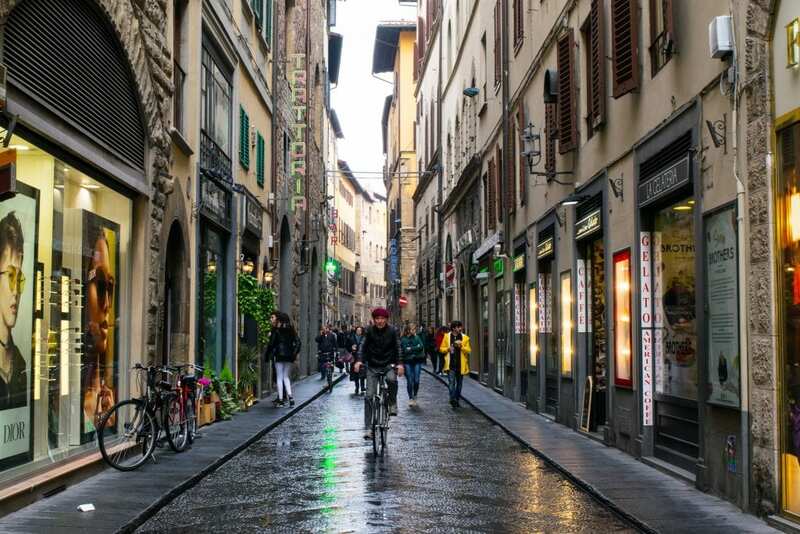 <3 Tuscany is incredible, you will love your time there!